AutoZIP II is free and the world's #1 Feature Rich compression utility. AutoZIP is fast, easy to use, intuitive, and intended to allow you to read and write to as many different archiving formats as possible. The competitors, WinZip and WinRAR, do not provide a general purpose tool. AutoZIP creates ISO archives, whereas 7Zip does not. AutoZIP handles essentially everything, while the competitors do not. AutoZIP can create write these archiving formats: Zip, 7Zip, WIM, TAR, ISO, BZip2, GZip and Xz. AutoZIP can read archives in the following formats: RAR, Zip, 7Zip, WIM, RAR, CAB, TAR, ISO, BZip2, GZip, Xz, ACE, ARJ, CHM, CramFS, DEB, DMG, FAT, HFS, IHA, LZH, LZMA, MBR, MSI, NTFS, RPM, SquashFS, UUE, UDF, VHD, XAR, and Z. * Supports multiple platforms - FTP Sites, Dropbox, Microsoft's OneDrieve, and Google Drive as well as your local computer - for simultaneously platform archive creation and management. * Also supports such features as (1) password and encryption, (2) creation of executable archives, (3) alternate compression levels, (4) multiple volume split capacity, and (5) the emailing of archives. * Fast and its compression ratio the best: For example, AutoZIP's 7Zip compression is 51% better than RAR, 48% better than WinZip, 24% better than Xz, 13% better than GZip, and 4% better than BZip2. * Enables you to merge archives of different formats. 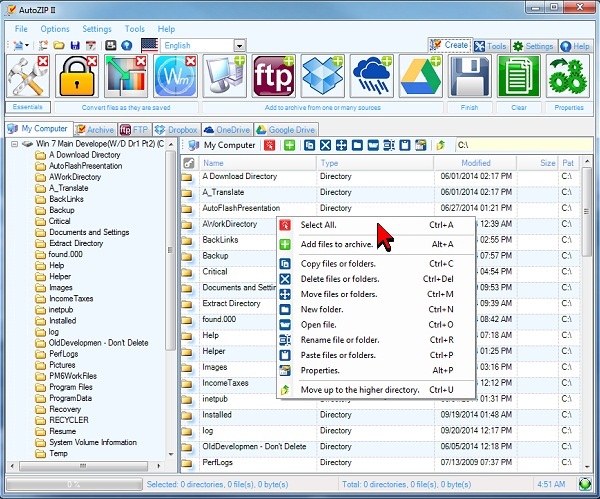 * Enables you to split any archive into multiple archives into any format. * Supports scheduling for either the creation or extracting from archives. * Scheduling integrates seamlessly to AutoFTP, Auto Shutdown Pro II, and other utilities with dynamic point-and-click processing, requiring no programming whatsoever. * Enables you to size image files to a common size and place your watermark on your images. * Runs in 66 different languages including English. * Quick and easy to install. * Oh yes, AutoZIP is free! Recent Changes: This is the initial release of the product. The product can be installed as a stand-alone product, but it also comes as a completed integrated utility within two others products: Auto Shutdown Pro II and Auto Shutdown Free for which it shares their version number of 4.5.0.0.